condition and to make changes to my road bike which would improve my cycling. This site is the story to staying fit with cycling along with the challenges of keeping a riding routine while traveling the USA full time in an RV. 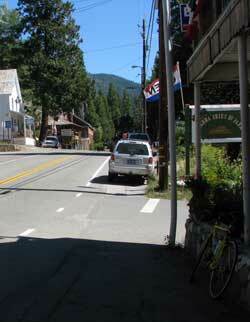 Wednesday, September 15, 2010: I'm currently workamping at six campgrounds near Downieville, California. I expect to be in this location until the end of October. 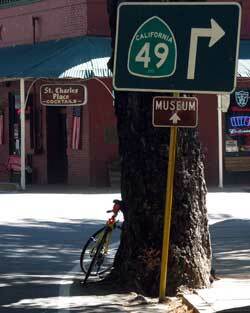 There is only one road through the area, Hwy 49, the famous California gold rush hwy which begins only a hundred miles to the northeast of us and follows the Sierra foothills to the south past Yosemite. All the little 1849 gold rush towns branch off of this hwy. In this area, Hwy 49 is two lanes, mostly rough pavement with little or no shoulder. It would not be a good road for road cycling except that traffic is light during the week. "training ride" for the century ride I have planned. 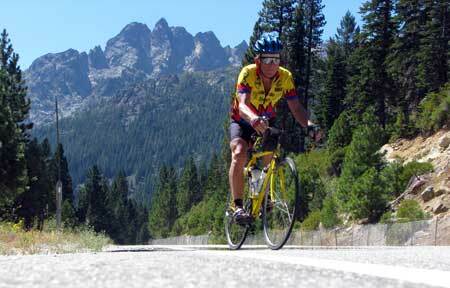 A century is 100 miles and often the goal of long distance cyclists as a marathon is the goal for runners. 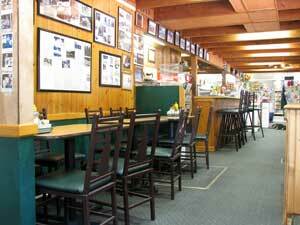 Bassetts Station is on my century ride route and will definitely be a refreshment stop. The photo above is on the Gold Lake ascent where I get to climb with the view of the Sierra Buttes to the west. 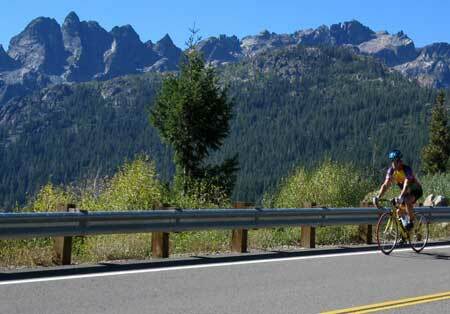 The Gold Lake loop is a popular weekend ride for hearty road cyclists. My current training goal is 600 miles in 30 days. I use MapMyRide.com to keep track of my training rides, create maps showing an elevation profile and to set training goals. So I get an email each day telling me what percentage of the goal I have met and how many days I have left to meet that goal. Currently I have ridden 283 miles with 19 days left in my goal so I'm on schedule. 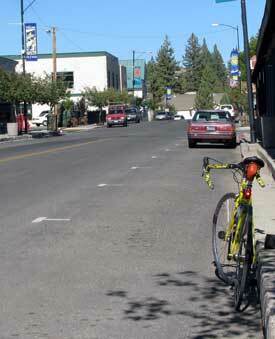 The photo to the left is of old town Portola in Plumas County. 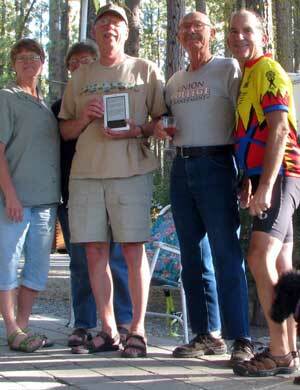 This is my second time to ride to Graeagle where my friends Ralph and Janet are camped for the summer. Last week, I arrived with lots of energy to spare so I added on the Portola loop to the ride which added some additional climbing and about 20 miles to the ride. On Tuesday nights, the local Elks club has a spaghetti feed which we all enjoy and gives us a good reason to make the long drive (ride) to Graeagle. Our friend Eddie came with Gwen in the truck for the spaghetti and the visit along the way. I've created a video of this ride to help give you the experience of long distance riding. It has been about eight years since I last rode a century ride. I've done many before that so I know what it takes. Like marathon runners talk about "hitting the wall" at about 18 miles, a cyclist hits "the wall" at about 80 miles. 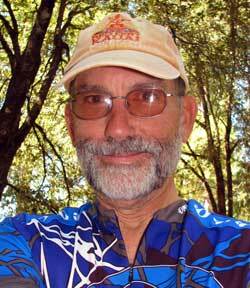 So I had to ask myself at the end of this 66 mile ride with 5,300 feet of climbing, could I do another 34 miles and climb Yuba Pass to get back to my starting point at Indian Valley Campground? I think the answer is that I need more leg strength, endurance and a quicker recovery time. I use to ride a century in about seven hours, six and a half on a good day. That won't happen with the ride I'm planning. At this point, I'll be happy to finish it and still be able to walk the next day. I began seriously riding again last May. When I first started, ten miles was a challenge. I knew it was going to take several months of a steady routine to get me back in shape. I also needed to lose weight, 195 pounds was the heaviest I had weighed. I'm now at 163 pounds and expect to loose even more. I'm feeling much better and with more energy than last May. 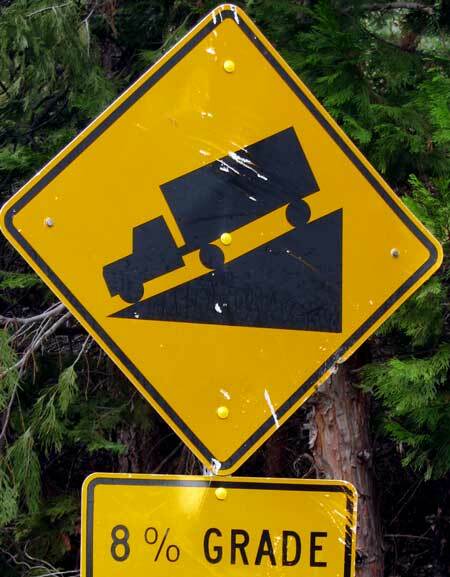 At the very least, I don't have to carry that extra 32 pounds up these climbs. Friday, September 17, 2010: We chose today to make a grocery run to Yuba City, California, about 1.25 hours driving time from our campground. We like Yuba City because it has a Winco grocery store and a Super Walmart. Gwen wanted to check out the Sunflower Natural Foods Market so while she was shopping, I turned on my laptop hoping for a stray WiFi signal. You see, I made a video of the 66 mile ride I did on Tuesday and had uploaded it to YouTube Tuesday evening but then decided the video needed some editing. The video was working fine on YouTube but I deleted it for the edited version. For some reason I could NOT get it to upload a second time. I tried five times but failed each time. I brought my laptop with me today thinking I should try uploading from a faster WiFi connection than what I have at the campground shooting between the trees. Yes, I found a WiFi signal on the corner of the Sunflower Natural Foods Market so I sat on the curb (not knowing where the signal was coming from) and uploaded my cycling video. This time, it worked and the video is now online. Please check it out above. I think it's pretty funny. If you aren't a cyclist, it will give you some idea of what it's like to ride for distance. Also, today, I've ordered a camera mount for my helmet so I can video record while riding my bicycle much easier. That means I will likely be uploading more videos in the future. I hope that will be a treat. Monday, September 20, 2010: Remember a couple of months ago I announced I had won prizes on the virtual Tour de France posting rides at MapMyRide.com? Those prizes arrived today. 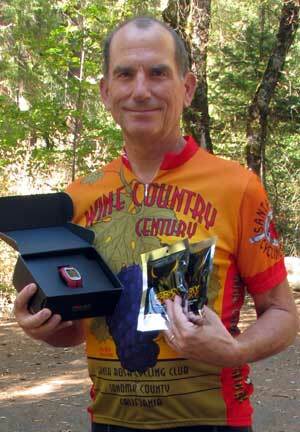 I got 24 packages of Perky Jerky and a Polar Heart Rate Monitor . Both will help with my training rides and cycling events. 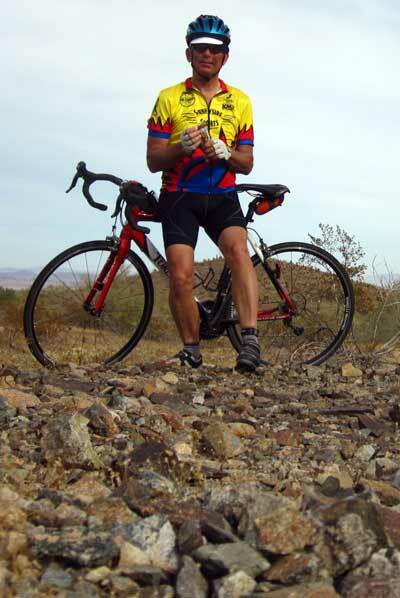 I won the prizes by riding my usual training rides, I was in New Mexico at the time, then posting the mileage and ride details on MapMyRide diabetes site. My mileage added to the many other riders participating and provided benefits to the diabetes association through fund raising by the riders. I donated to the cause myself but many of the other riders had sponsors donating also. Next year, I'll start participating far in advance of the race and ask for sponsors myself. I've been reading the instruction manual for the Polar heart rate monitor much of the evening and this monitor will do much more than the one I rode with 20 years ago. 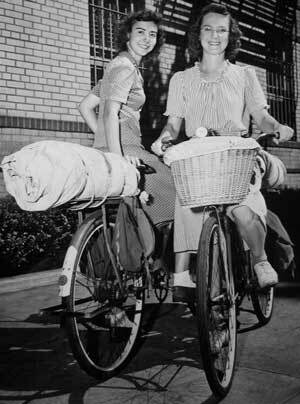 Tuesday, September 21, 2010: While exploring bicycling Web pages using Stumbleupon I came upon this delightful story of two 21 year old college graduates touring the eastern United States by bicycle in 1944. The adventure takes Thelma Popp and Doris Ray from New York west, down the Mississippi on a river boat and over some tough mountain climbs by truck. Then a return to New York along the Atlantic coast. They make journals along the way which Thelma Popp Jones turns into this easy reading book in 2007 available free on the Internet. The title of the book is The Lure of the Open Road. Since I'm 63, Thelma's book describes a bicycling adventure 3 years before I was born. She describes a United States, and the citizens of those states which I have never known. Besides the life and characters she details in her stories, I'm amazed that these two bicycles, one single speed and the other two speed, are up to the task. The book reads quickly and will hold your interest so I can highly recommend that you visit the link above and read the stories yourself. now. It was my first time to ride with bib shorts and I like them over the regular shorts and like the "Craft" brand (made in Sweden). Gwen left early this morning on a trip to Oregon with our friend Kathy. They both had some Oregon errands which needed to be completed this year. That leaves me without a vehicle and a meeting to attend today at Sardine Lake, 5,600 feet with me at 2,200 feet. That's OK, I do that ride all the time for training but today I did it for work. It was a total of 61 miles with more than 4,000 feet of climbing. The first half of the ride took 3 hours but I was rewarded with bratwurst, sour kraut, potato salad, baked beans and lots of olives plus dessert. It's a good thing I burned nearly 3,500 calories on my ride today. The weather wasn't all that cold but wet at the 2,200 foot level plus colder and wetter at the 5,600 foot level, hence the rain gear. 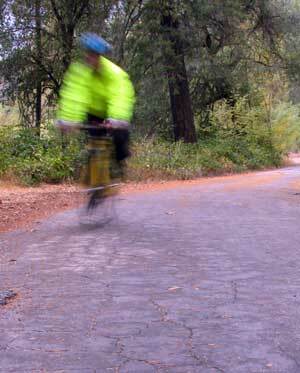 Since my photo is fuzzy, that will give me another reason to add a photo later in all my rain gear. on hand, it was a bonus. 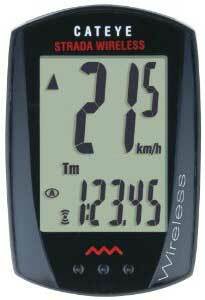 I don't wear my reading glasses while cycling and the display is large enough for me to see while riding. Finally, it was inexpensive with free shipping. days in a month I could mark this ride as "great". Great because of the 56 degree weather, little traffic, no wind, I was wearing the right riding clothing, and a strong feeling of conditioning. I will show you the camera and videos later as I learn how to use it. can see and the entrance to Indian Valley campground where we are camped. I originally did this hoping I could narrate the movie as I rode along. With the camera facing forward, all you will hear is the moving air as it passes over the microphone. Unfortunately, it's not much better with the camera facing to the side. I've decided I can only dub the audio after I bring the camera back to my computer. So the movie is CRUDE but my first try with this format. I'll get better at it and so will the videos. Click here to see the video. cousins. I never saw one. 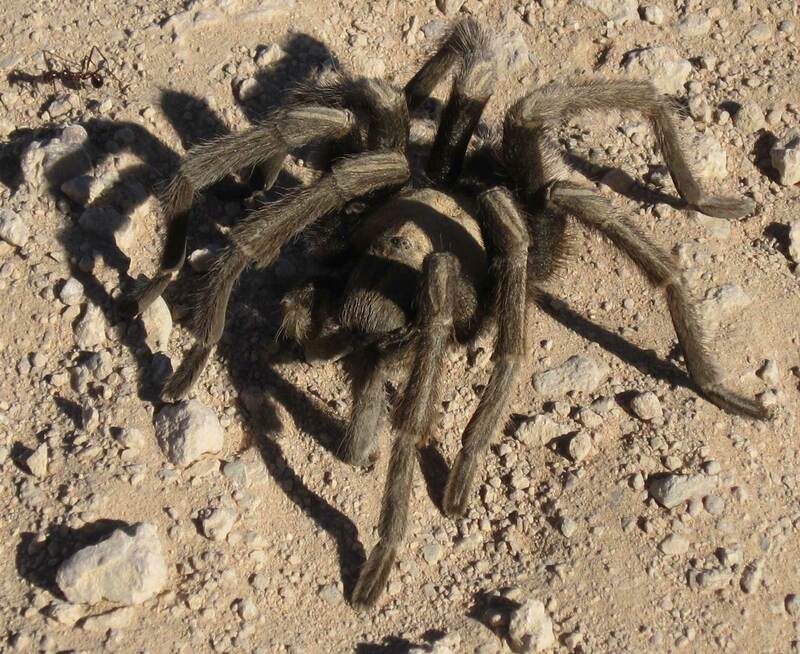 I have been relaxed in camp and while caring for all six campgrounds yet this fellow was only a few miles from where I'm camped and at a higher elevation. I'm sure there are more around. 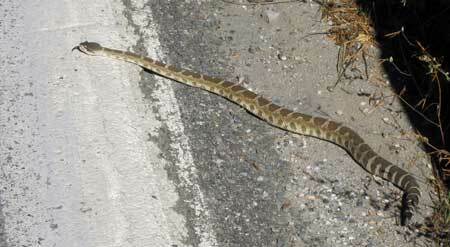 I chased the reptile back off the road, the next vehicle undoubtedly would have crushed it. I hope all his relatives will take that into consideration if they come across me in the woods. Sunday, October 17, 2010: Why not use the Internet to help protect your bike. Bike Revolution is a new bike security service. You can register your bike free including a photo of the bike. 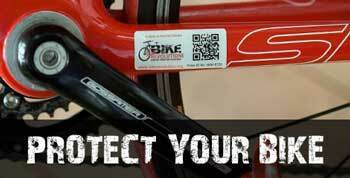 The security stickers for your bike help too and provide income to this nonprofit organization. You can participate in stolen bike recovery with your smartphone. As more cyclists get involved, I see this as a valuable use of the Internet to help protect our investment and discourage thieves. Both my bikes are registered. amount of descent. It was a tough century, one I created because I couldn't do the Tahoe-Sierra Century in September which was organized by the North Lake Tahoe middle school and high school bands as a fund raising event. I had to work instead. I DID buy their jersey and wore it for the first time on this century ride. 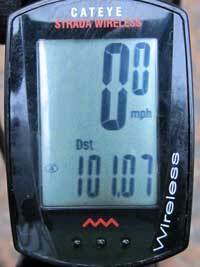 Since it was a music century, I whistled: "Whistle a Happy Tune" for 101.07 miles. You can view a short video here. I actually finished this ride feeling really good. For some of the other centuries I've done, I can remember feeling pretty awful and one even gave me heat stroke many years ago. This time, the weather was perfect and I did the ride at my pace stopping to take photos along the way. It was a total of 7 hours 39 minutes in the saddle which was one of my longest times for a century, perhaps the more than 50 miles of climbing had something to do with that. What's next? Oh! Click the Sierra Buttes photo above to enlarge it. Thursday, October 21, 2010: I've made another video. 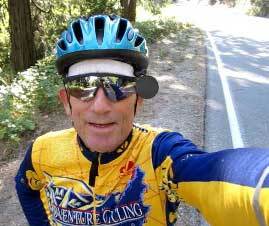 This time it's using the camera mount to my helmet as I descend Cal Ida Road. 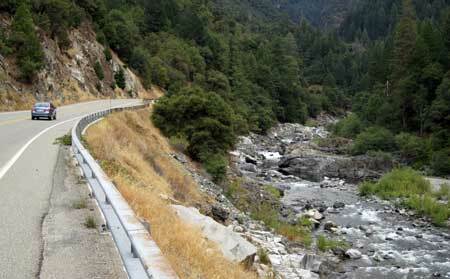 CI Road is off Hwy 49, 12 miles west of Downieville, California. 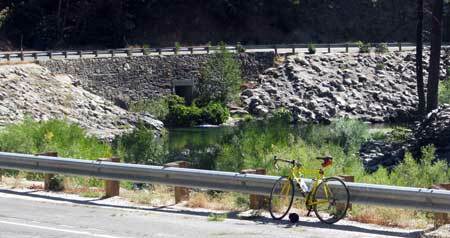 It's a single lane, paved road, climbing from the Indian Valley Recreation Area into the wilderness of the Sierra Foothills. The summit is 15 miles from Hwy 49. It's a wonderful climb of about 6% grade with very little traffic, EXCEPT, without a breeze, I can't climb fast enough to keep the cloud of mosquitoes behind me. So I must pick the right COLD day or a day with a breeze. On those days, it's a great ride both up and down the mountain. The video shows the last 4.5 miles in the descent off the mountain. Click here to see the video. The guy at the left is me with a beard which lasted only a month. is a Torelli Montefalco with all Shimono Ultegra drive train, compact double (here is a discussion of the compact double) with ten speed cluster. I was surprised to get an eleven to twenty-eight gear range in the cluster. That means, an eleven tooth tiny gear increasing to a twenty-eight tooth large gear. 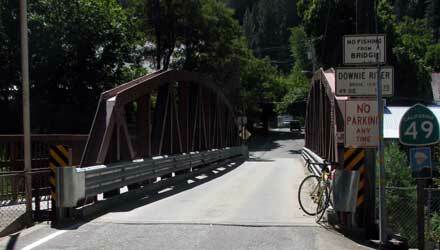 That should give me the range of gears I need for those 36 mile climbs I was doing on highway 49 near Downieville. The wheels, tires, stem, handlebars and seat post are all Torelli brand. 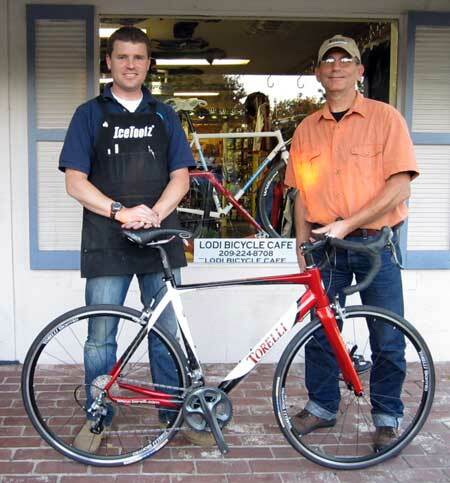 What a pleasure it was to shop at the Bicycle Cafe which specializes in road bikes. Most shops these days sell mostly mountain bikes or cruisers and generally don't know the "road-bike talk". Jon's credentials come from the road-bike world where he has raced and served as head mechanic to some of the bicycling superstars. He has a huge collection of jerseys which he wore in races or which where given to him by racers he served as a mechanic. 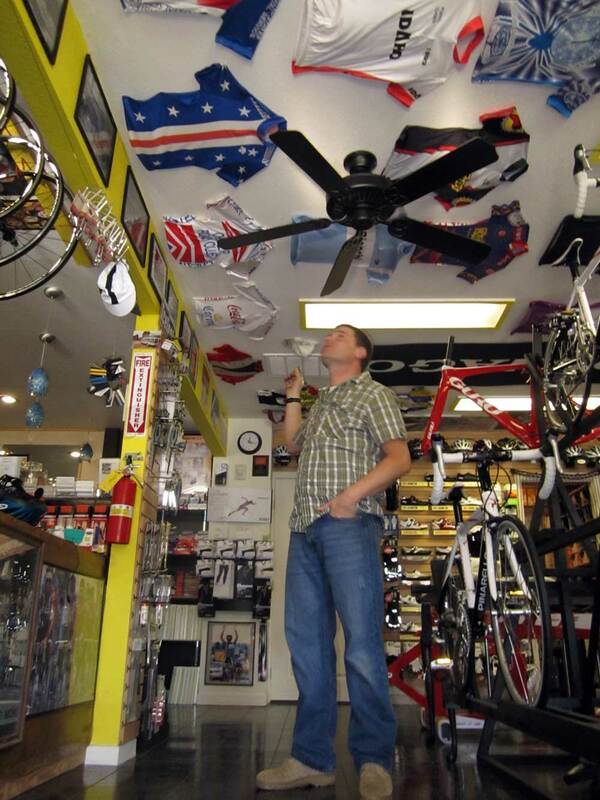 Click the photo to see part of the collection which he has mounted to the ceiling of his bike shop. You might be wondering what a "bicycle cafe" is. Jon explains that many cyclists love to come to his shop to "talk riding". He serves a great cup of coffee so now customers and cycling enthusiasts can enjoy a cup-o-joe while exploring all the new equipment. the car lanes. Since a road bike tires are very delicate, they get flats easily. I would still pull over into the bicycle lane when cars are passing and I believe most cyclists would too unless the glass was obvious which is often the case. After Lindsay returned home I came across the situation in the photo. In this case the bicycle lane is next to the car lane but a parking lane is to the right of the bicycle lane. If a cyclist rides in the bicycle lane they are taking a chance of getting creamed by a car door or pushed into traffic if someone in the car opens the door. This is called a "Door Zone" accident and several cyclists have been killed by such accidents. In this case the cyclist must ride on the very outside of the bicycle lane near moving traffic in order to avoid opening car doors. So this is another situation where a cyclist may ride outside a bike lane. 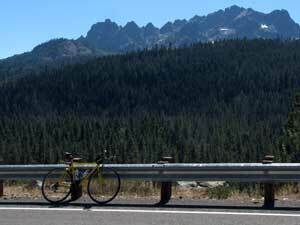 Friday, November 26, 2010: This is the ride I want to do next year. 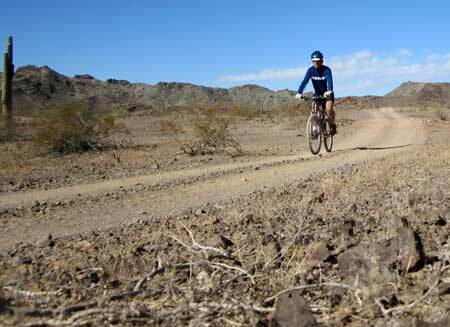 It's the El Tour de Tucson which happened this year on November 20. 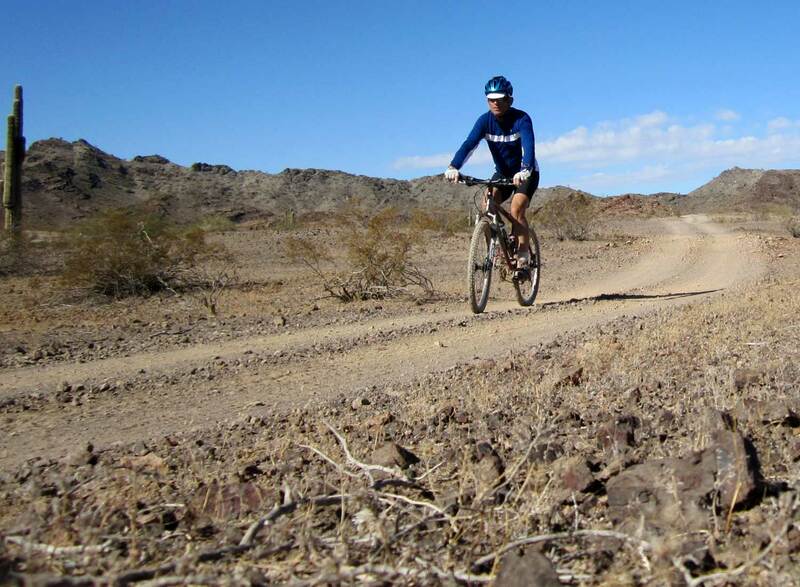 The ride is 109 miles around the perimeter of Tucson, Arizona. This year more than 9,000 riders showed up even with a wind of 30 mph. I better start preparing right NOW. For more information and photos, click here. The above photo was published in the Arizona Star, 11/21/10. The El Tour de Tucson is sponsored by the Perimeter Bicycle Club and a benefit for the University of Arizona, University Medical Center. 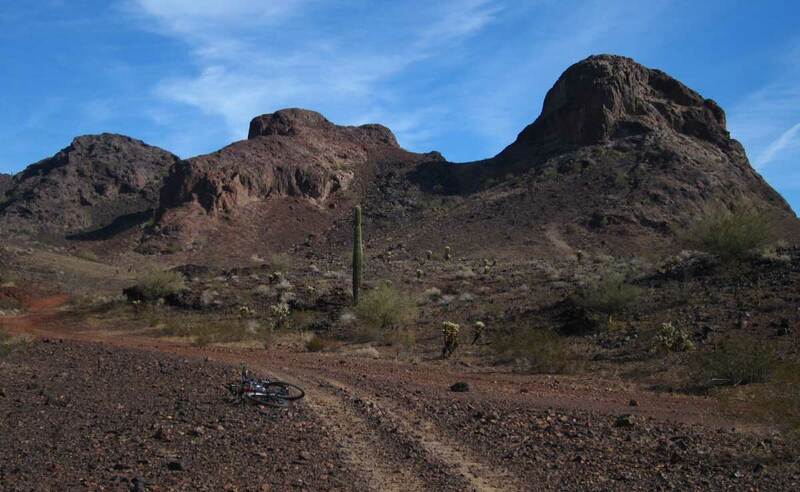 Sunday, November 28, 2010: There is great mountain biking in this part of the Arizona desert. The day was clear, 50° but a 25 mph wind made it a cool ride. Notice the long sleeve jersey and cycling cap. Pass your pointer through the photo then click the photo for an enlarged view. This part of the road looks easy but this road disappears and turns into a rocky path with the rocks rolling under the tires throwing the bike one direction or another. 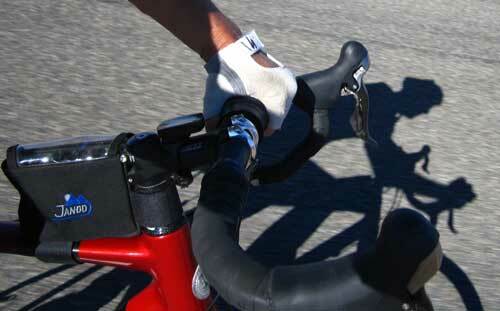 I've had three "warning falls" which has caused me to change pedals and ride more conservatively. While on today's ride I came across this little guy waiting for me on the path. He looks very healthy and is ignoring the ant to his right. You must click the photo to get a better view of the ant and to peer into this guy's eyes. 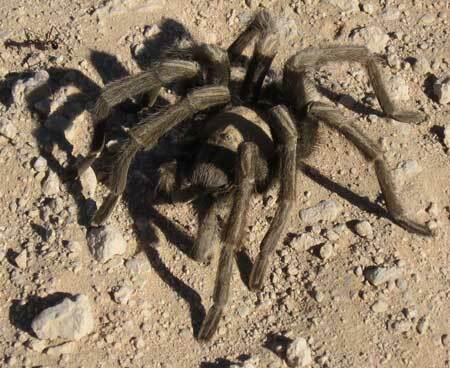 When I was doing my student teaching in a junior high school science class, the master teacher kept a pet tarantula which everyone, including me, held. I chose to leave this guy where he sat. This guy measures about 6 inches from end to end. 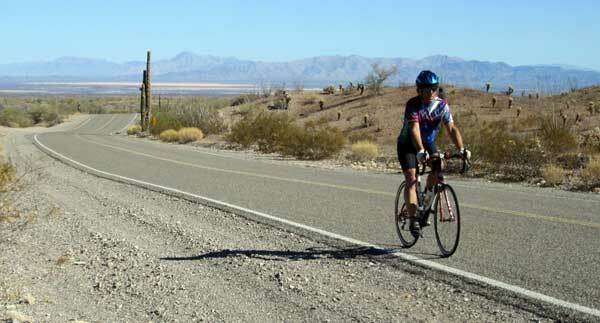 Thursday, December 2, 2010: Today was a great day for a rode over Quinn Pass to Quartzsite from Bouse. 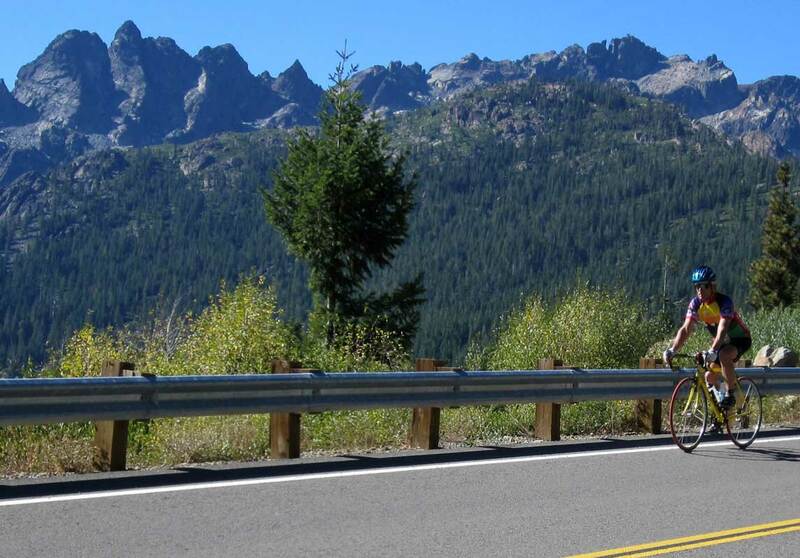 The route includes 1220 feet of gentle climbing and is only 25 miles one way. The route would make a great out and back ride of 50 miles except for a 5 mile section on Highway 95 which is heavily used and only a 6 inch shoulder. The majority of the ride is on Plomosa Road, good pavement and lightly traveled. I generally see fewer than a dozen cars in both directions when riding Plomosa Road. Compare the desert views to the mountain views near Downiville. There is NO water here but it's December and notice I'm still riding in a short sleeve jersey and shorts. Click the photo for a wider view. The Bouse valley and Highway 72 is in the distance. 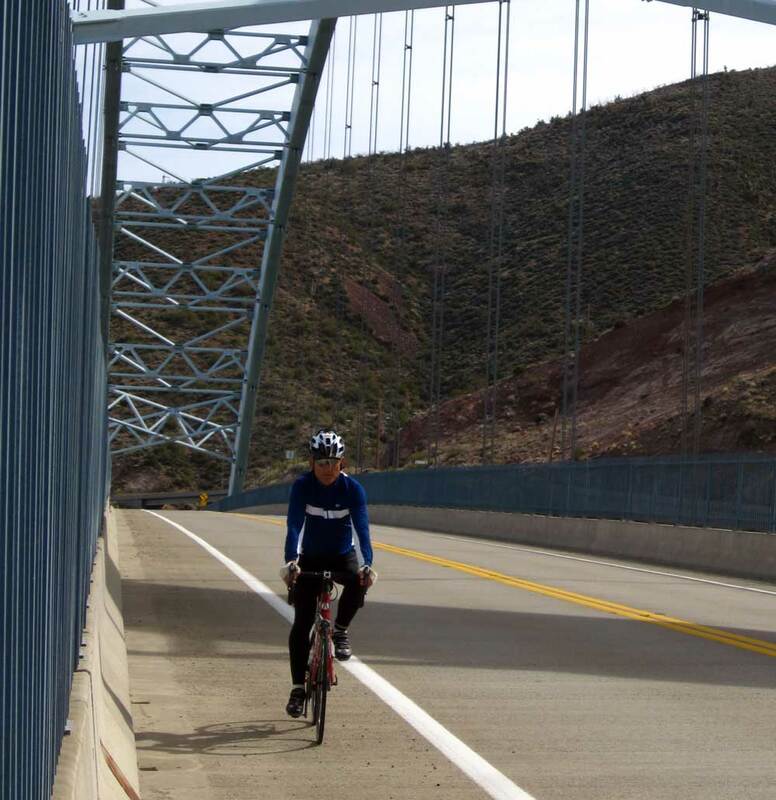 High winds can be a factor here in the Arizona but no wind today which made for a very pleasant ride. Click here to see a map of the route. 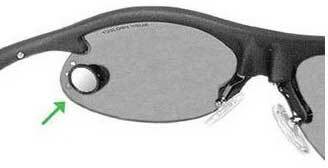 Saturday, December 4, 2010: I've ridden with a helmet mounted rearview mirror for at least 30 years but I'm ready to try something new to eliminate the negatives. 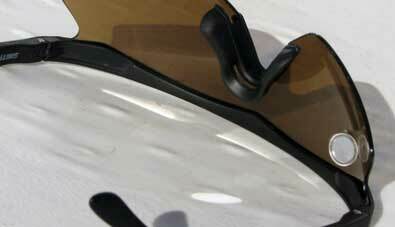 The Cycleaware Viewpoint Eyewear Mirror is reported to have the rearview benefits without the negatives. Click the link to see what others have to say. I'll give it a try then report back. approaching traffic without having a mirror post mounted to my helmet (which has always been annoying). I am learning to put my glasses arms on the outside of the helmet straps to help keep the straps out of the view. On a cold day, I'm wearing a skull cap with a chin strap which cuts the view in half so reduces the view. Still, I'm liking the Viewpoint and expect to improve the use with practice and time. Tuesday, December 7, 2010: After 41.6 miles of riding and a long time since breakfast, I stopped at the top of Quinn Pass for a snack and a closer look at the desert view. The weather is improving, a strange thing to say on December 7. The forecast for the next week shows warming to nearly 80 and little or no wind. I'm looking forward to continuing my riding in summer riding conditions in Arizona. 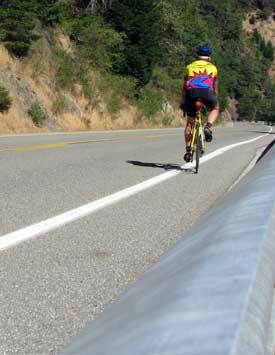 Tuesday, December 28, 2010: Yes, it's still sunny in Arizona and I'm riding in summer shorts and jersey. I liked the shadow while climbing toward Quinn Pass. The sun is low in the sky, even at 1:30 pm, so there are long shadows. Little wind today made for a nice ride. The temperature was just into the short sleeve weather for me, any colder and I would have been into a long sleeve jersey. The JanDD pouch behind my stem is where my camera rides, easy to get to. Tuesday, January 4, 2011: I decided to ride around the Three Peaks on this cold day. 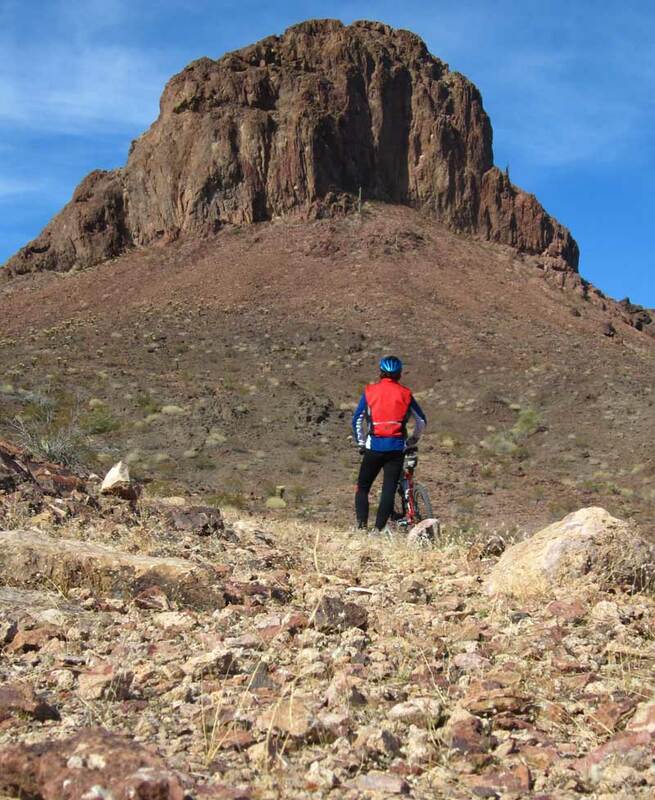 The Three Peaks are only 7 miles from our campsite with good mountain bike roads the whole way. It was also a continuation of my searching the area for optional camp sites. The three peaks are 5 miles off the nearest paved road and a mountain bike or ATV is needed to access them. The "front view" (view from the paved road) of the Three Peaks is pictured below. Click the photo to see the "back view" (from the opposite side of the mountains. 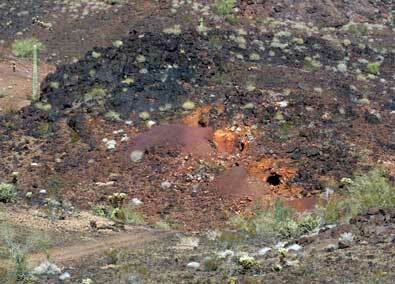 There is obvious mining activity all around the area (see the photos below). The photo on the right with my shadow in the photo is of a "glory hole". 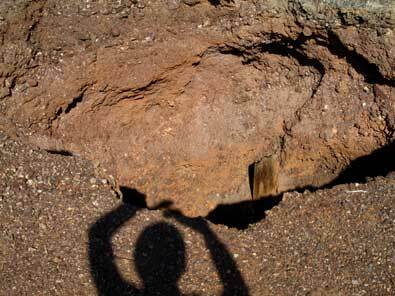 I took the photo purposely with my shadow to give you an idea of the size of the hole. I did NOT venture closer to the hole knowing the area around it could be unstable. I threw a rock into the hole and I could hear it bouncing down for at least ten seconds. The entire loop ride around the Three Peaks took 2.5 hours and about 20 miles. This photo shows me taking in the view of the largest of the Three Peaks from the front side. Click the photo for a larger view. On the back side of the mountains is a water collection device. This device will collect rain water and heavy dew. Click each photo for additional views. 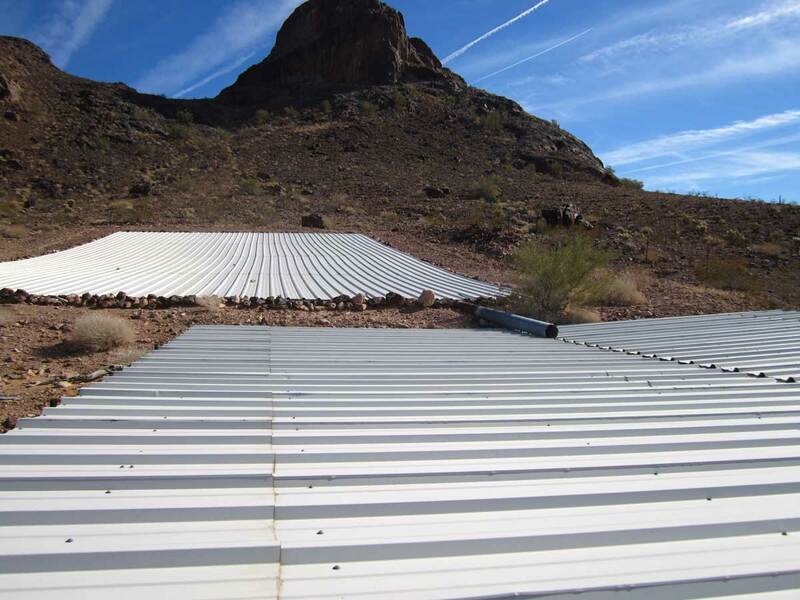 Behind the left photo is a view of the collection panels slanted to force the water into a trough then drained into a large covered holding tank. 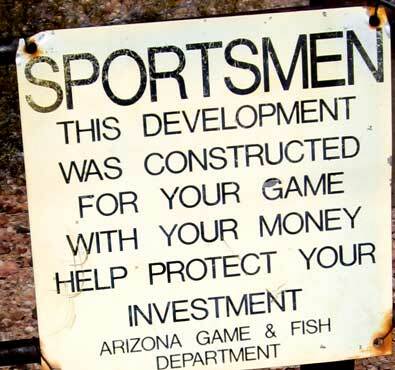 Behind the Sportsmen sign is a view of the holding tank under the collection panels. 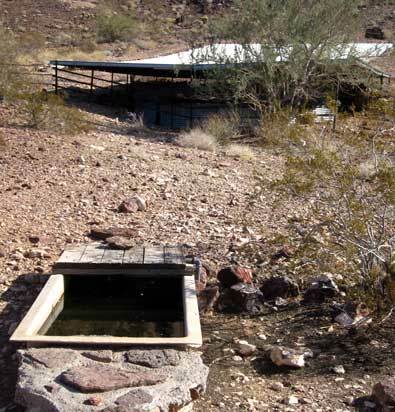 All water drains into the covered holding tank. 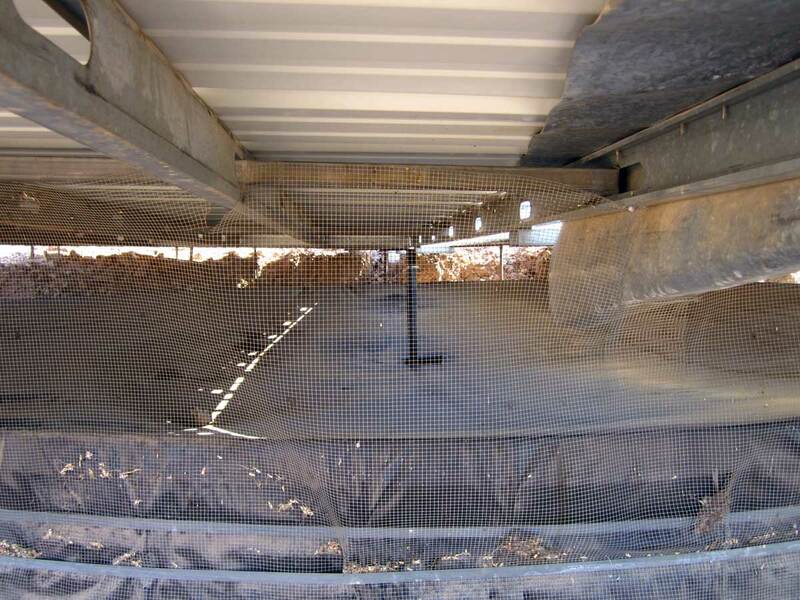 The tank is surrounded with a net to keep animal from climbing into the tank. The believe dew is very heavy in the summer months so I imagine water is present even during the very hot summer days. I did find a nice gravel road toward the mountains good enough for much of the route to bring the trailer if we decide to change locations next year. Wednesday, January 12, 2011: I've decided to use the Park Tool Chain Gang Chain Cleaning System to clean the chain on my bike. The bike store showed me a different method for chain cleaning but I don't often have access to a water hose so I decided it's much easier to use this chain cleaning system regularly than to depend upon finding a high pressure hose regularly. A small amount of cleaning agent is added to the cleaning chamber, the chamber is snaped over the chain then the chain is run backwards through the cleaning solution. 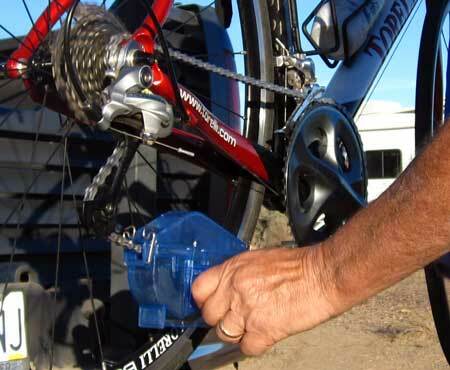 It still makes a mess but the mess is much smaller than the alternative to chain cleaning. I generally clean my chain every 200 miles. Tuesday, February 8, 2011: What a great area to road ride. This is the shore of Roosevelt Lake, Arizona, northeast of Phoenix at 2,200 feet elevation. Hi way 188 is wide with good shoulders and little traffic this time of year. We'll be leaving here soon so I don't know what the traffic is like during the rest of the year. The ride temperatures have been a little low lately, high 40s to high 50s, hence the long sleeve jersey and leg warmers. I believe you can expect 60s normally this time of year. The Theodore Roosevelt Bridge was constructed in the early 90s and is impressive. In 1995 it was designated one of the top 12 bridges in the nation for "overall design, size, eye-appeal and design challenge". Be sure to click both these photos to see additional views of the ride and bridge. 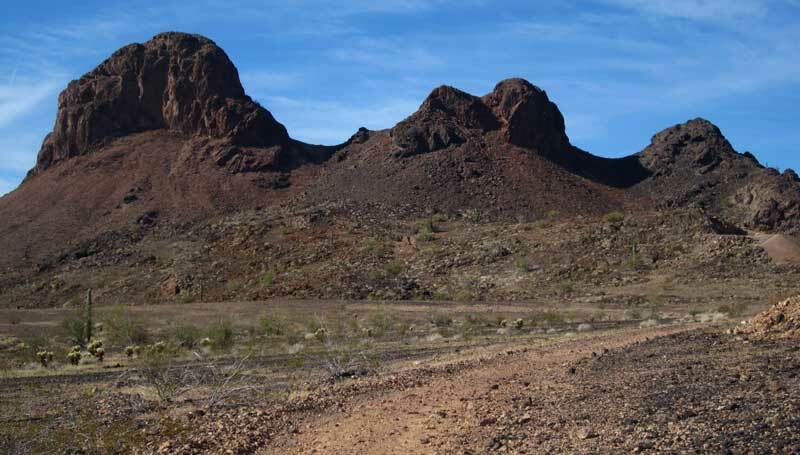 From this location, the Roosevelt Lake visitor center is only about 3/4 mile where area history can be explored. In addition you can visit the gift shop for area souvenirs. 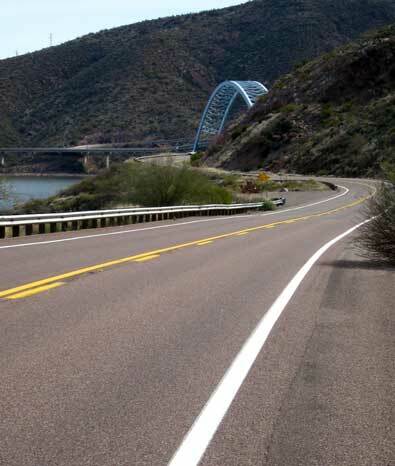 A good ride is to park at the visitor center, ride east to the Tonto National Monument visitor center, do the hike to the "Lower Cliff Dwellings", hop back on the bike and continue east to the tiny town of Roosevelt (about 10 miles), turn around, ride back to the visitor center. For a longer ride, continue riding west to Punkin, turn around and ride back. You can grab snacks or lunch in Roosevelt or Punkin. 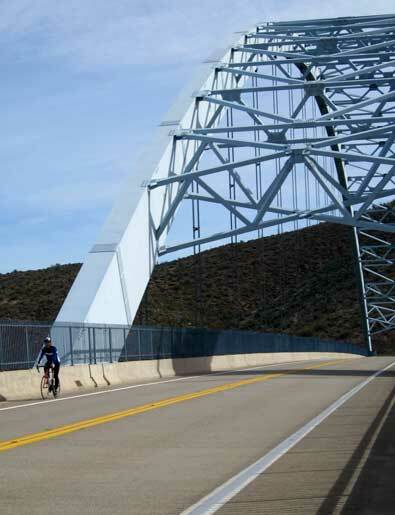 Doing this route will take you most of a day and give you the chance to ride the Roosevelt Bridge twice.